NAN: You’ve been interested in electronics since the age of 9. Give us a little background information. What was your first project? JACK: My first project was a crystal radio with the inductor wound on the quintessential Quaker oatmeal box! It was really exciting to get AM reception over that. Back then, pretty much no one had FM. AM was it. Later I learned to repair TVs and made pocket money doing that. Those sets were all vacuum tubes. Usually there was just a bad tube or dried out capacitor. But from there, my friends and I learned to design amplifiers (the Beatles were very hot and everyone was starting a band). For graduation from eighth grade, my dad gave me an old oscilloscope he had built from a kit years earlier. When I was 16 I got a ham license, built various transmitters, and used WWII surplus receivers. One day an angry letter arrived from the Federal Communications Commission (FCC). They had picked me up on my second harmonic clear across the country. I was really proud of that contact. But it wasn’t long before some resistor-transistor logic (RTL) digital ICs came my way. Projects included controls for tube transmitters, Estes model rocket telemetry, and even a crude TV camera that used a photomultiplier tube to scan a spiral set of holes in a spinning disk. A couple of us worked on a ham radio moon bounce, but I accidentally shorted out a resistor and my only hydrogen thyratron (sort of a tube version of an SCR) blew up. There was no money for a replacement, so that project died. The transmitter used a little lighthouse tube that had a maximum rating of a couple of watts, but it worked OK when pulsing it for a few microseconds at 1 kW. Senior year of high school a friend and I hitchhiked from Maryland to Boston to go to a surplus store. I bought a core memory plane that was 13,000 bits in a 6 in2 cube. Long hair didn’t help. We were picked up on the New Jersey Turnpike and strip searched. The cops never believed my explanation that the thing was computer memory. A few years later, I had a 6501 microprocessor in the glove compartment of my Volkswagen bus (which I lived in for a year while saving for a sailboat). Coming into a sleepy Maine town from Canada that event was repeated when the border cops searched the bus and found the chip. They didn’t believe in computers on a chip. But the PC was years away and computers were mostly seen in science fiction films. Freshman year of college, I designed and built a 12-bit computer using hundreds of TTL chips soldered together using phone company wire on vectorboards. For I/O there was an old Model 15 teletype using 5-bit Baudot codes that my software drove via bit banging. The OS, such as it was, lived in a pair of 1702 EPROMs, which each held 256 bytes. The computer worked great! And then the 8008, the first 8-bit microcontroller, came out and the thing was obsolete. I junked it, and now I wish I had saved at least the schematics. But by then I had been working part-time as an electronics technician for a few years and the company needed to update its analog products to digital. No one knew anything about computers, so they promoted me to engineer. Eventually I ran the digital group there. We designed one of the first floppy disk controllers, insanely high-resolution graphics controllers, and a lot of other products. We also integrated minicomputers (Data General Novas and DEC PDP-11s) into systems with microprocessors. We bought a 5-MB disk drive for a Nova. It cost $5,000 (back when that was a lot of money) and weighed 500 lb. How things have changed. NAN: Tell us about The Ganssle Group (www.ganssle.com). When and why did you start the company? What types of services do you provide? 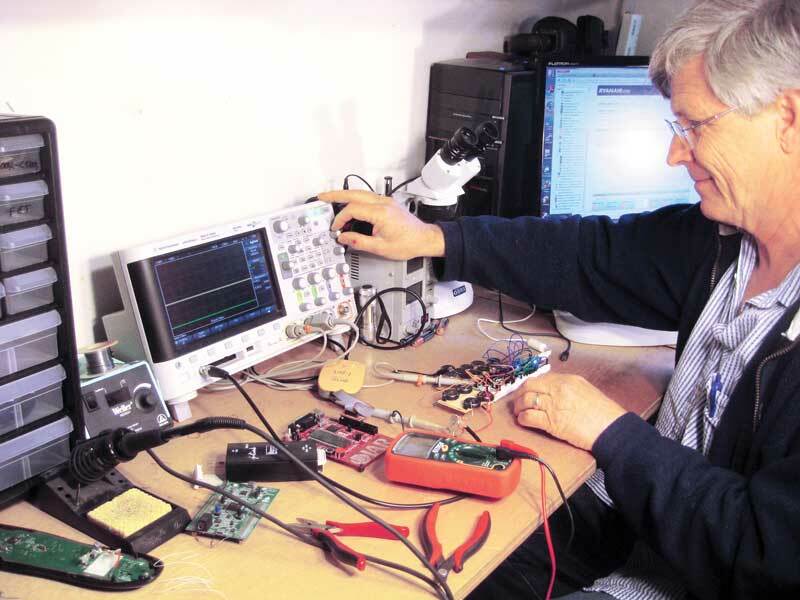 JACK: I formed The Ganssle Group in 1997 after 15 years of running an in-circuit emulator company. Working 70 h a week was getting old and I wanted more time with my kids. So my objective was to reverse the usual model. Instead of fitting life around a job, I wanted to fit the job into life. Goal 1: Four months of vacation a year. It turns out that is elusive, in no small part due to the cool stuff going on around here, but most years we do manage two to three months off. My wife, Marybeth, works with me. She takes care of all of the administrative/travel and the like. Goal 2: No commute. So we work out of the house (for the first few years, we worked out of the houseboat where we raised two kids). Now the kids are grown, so there’s a Goal 3: Have as much fun as possible with Marybeth, so when I travel to new or interesting places she often accompanies me. There’s a lot more to life than work. Some of my side projects are available at www.ganssle.com/jack. I’m not really sure what I do. I write—a lot. Readers are incredibly smart and vocal. The dialogue with them is a highlight of my day. I also give one- and two-day seminars on pretty much every continent (except Antarctica—so far!) about ways to get better firmware done faster. Sometimes I do an expert witness gig. Those are always fascinating as one gets to dig deeply into products and learn about the law. On rare occasions, I’ll do a day or three of consulting if the problem is particularly interesting. And there’s always some experiment I’m working on, which sometimes gets written up as an article. 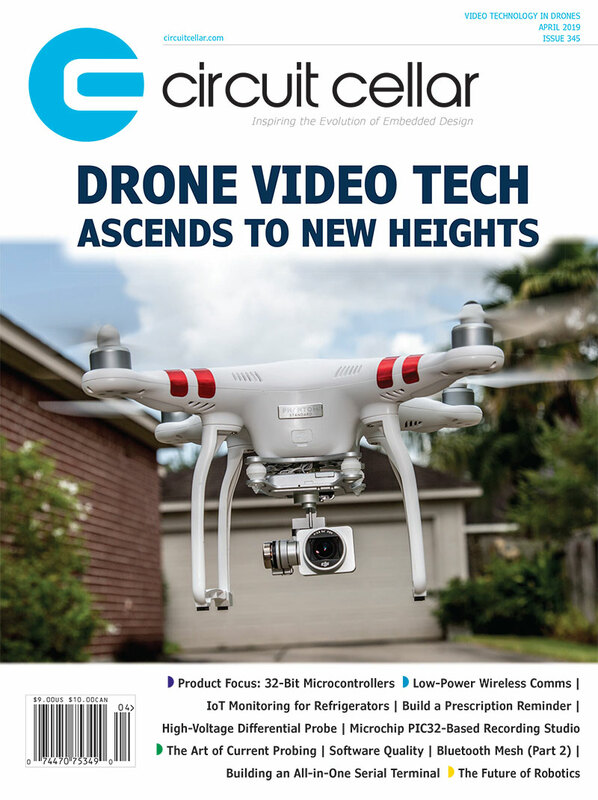 NAN: Speaking of articles, you’ve written hundreds—including nine for Circuit Cellar magazine—on topics ranging from the history of the embedded systems programming industry, to memory management, to using programmable logic devices (PLDs). You also write a column for Embedded (www.embedded.com) and you are editor of the biweekly newsletter The Embedded Muse. Tell us about the types of projects you enjoy constructing and writing about. The breadboard is discharging batteries. To the left, a battery is soldered to some coax. Using the waveform generator in the oscilloscope I’m measuring the battery’s reactance (which, it turns out, is entirely capacitive). The IAR tool is profiling current consumption of an evaluation board. JACK: I have one experiment that’s running right now. For the last four months I’ve been discharging coin cells. It sounds dull, but some microcontroller vendors are making outrageous claims about battery life that are on the surface true but irrelevant in real circuits. This circuit runs a complex profile on the batteries, tossing different loads on for a few milliseconds, and an ARM microcontroller samples the batteries’ voltage (as well as the transistors, VCE drop) into a log file. That data goes into a spreadsheet for further analysis. I’m making a much bigger version of this now, which will handle far more batteries at a time. I recently gave some preliminary results at a talk in Asilomar, CA, which garnered a lot of interest. More results will be forthcoming soon…I promise! Another aspect of this is leakage. Does handling a battery leave finger oils that can affect the decades-long life claimed by the vendors? To test this, I built a femtoammeter. A polypropylene capacitor is charged and feeds a super-low bias current op-amp. Another ARM board monitors the op-amp voltage to watch the capacitor discharge as various contaminants are electrically connected to the capacitor. With no contaminants connected, even after 48 h, the cap discharged less than 1 mV. The thing resolves to better than 10 fA. (One fA is a millionth of a nanoamp, or about 6,000 electrons/second). NAN: You wrote the two-part Circuit Cellar article series, “Writing a Real-Time Operating System” (Issue 7 and 8, 1989) about the Hitachi HD64180 Z80-based embedded microprocessor nearly 15 years ago. Circuit Cellar also featured another HD64180-based article, “Huge Arrays on the HD64180: Taking Advantage of Memory Management” (Issue 16, 1990). What was your fascination with the HD64180? Also, is either of these projects still current? Have you changed any of the design components? JACK: Gee, I have no idea. I wrote those using Microsoft Works, but the file format has changed and Works can no longer open those articles. Alas, the HD64180 is quite obsolete. It was a grown-up version of the Z80 and very popular in its day. In 1974, Intel introduced the 8080, which was the first really decent 8-bit microprocessor. But it needed two clocks and three power supplies. The folks at Zilog came out with the Z80 a year later. It could run 8080 code, but had one clock, a single 5-V supply, and it offered additional instructions that massively improved code density. Intel responded with the 8085, but it was really an 8080 in drag. The couple of new instructions added just couldn’t give the Z80 a run for its money. Eventually Zilog came out with the Z180, and Hitachi the 64180 clone, which included on-board peripherals and a memory management unit to address 1 MB using standard Z80 instructions. It was a great idea, but since there was no on-board memory, it couldn’t compete with microcontrollers such as the ancient, and still-going-strong, 8051. NAN: In addition to writing, you lecture and teach at conferences and symposiums worldwide. Tell us about your one-day “Better Firmware Faster” seminar. How did it begin? What can attendees expect to gain from it? JACK: I’m completely frustrated with the state of firmware. It’s inevitably late and buggy. While there’s no doubt that crafting firmware is extremely difficult—after all, software is the most complex engineered product ever invented—we can and must do better. It’s astonishing that so few groups keep even the simplest metrics, yet engineering is all about numbers. The seminar is a fast-paced event that shows developers better ways to get their code to market. It covers process issues, as well as a lot of technology areas unique to embedded systems, such as managing memory and dealing with tough real-time problems. What can attendees get from it? It varies from very little to a lot. Some groups refuse to change anything, so will always maintain the status quo. Others do better. Some report 40% improvements to the schedule and up to an order of magnitude of reduction in shipped bugs. NAN: You started three high-tech companies prior to The Ganssle Group. Tell us about your work experience. Any highlights? JACK: Well, there was one instrument that used infrared light to measure protein in cow poop. Though it was interesting technology, it’s hard to call that a highlight. The design I’m most proud of was my first emulator, which had only 17 ICs and used insanely complex code. Eventually we offered emulators that required hundreds of chips, but those cost $7,000, while the first one sold for $600. Some of the government work I’ve done was very interesting and used extremely sophisticated electronics. But I can’t talk about those projects. A buddy and I did the White House security system during the Reagan administration. It was fun to work in the basement there, but the bureaucracy was stifling. We lost our White House passes the same day Oliver North did, but he got more press. JACK: Everything is going to change for us over the next five to 10 years. We will have tools that automatically find lots of bugs. Everyone is familiar (and has a love/hate relationship) with lint. But static analyzers can today find lots of runtime bugs. These are currently expensive and frustrating, but they demonstrate that such products can, and will, exist. When the issues are resolved, I expect they’ll be as common as IDEs. Debugging manually is hugely expensive. Another tool is slowly gaining acceptance: so-called virtualization products (e.g., from Wind River and others). These are not the hypervisors people think about when using the word “virtualization.” Rather, they are complete software models of a target system. You can run all—and I mean all—of your code on the model. The hardware is always late. These tools will permit debugging to start at the beginning of the project. The tools are also expensive and somewhat clumsy, but will get better over time. A modern smartphone has more than 10 million lines of code. Automobiles often have more. One thing is certain: Firmware will continue to grow in size and complexity. The current techniques we use to develop code will change as well. This entry was posted in Interviews and tagged design, embedded development, engineering, firmware, Jack Ganssle, microcontroller, software, The Gannsle group by Circuit Cellar Staff.